Donations are now being accepted for the University of Wyoming’s 2014 Holiday Food Drive, sponsored by the Staff and Faculty Senates and UW Transit and Parking Services. The goal is to assist UW employees and their families who may need a little extra help during the holidays. 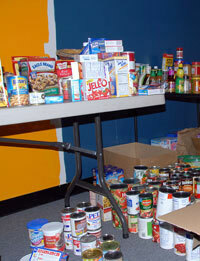 Food donations will be accepted on campus at various locations through noon Thursday, Dec. 18. Contact your staff senator for donation box locations. Nominations are open through Sunday, Dec. 14. All current employees are eligible to be nominated. To nominate a UW employee to receive a food basket, click here. UW Transit and Parking Services is offering an opportunity to bring in two nonperishable food donations to receive a discount on outstanding parking citations valued at $31.50 or less. To learn more, click here.